For those who imagine landscapes while listening to music, Tom Heasley's work will surely conjure up visions of Sunset Beach at dusk or Haleakala Crater just before dawn. 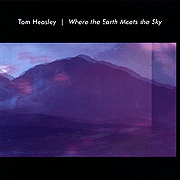 His album, Where The Earth Meets The Sky, is a study of the stillness in moments between states. 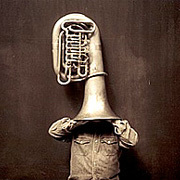 The tuba, wondrous in its corpulence, is the sound source from which this album stems. Harmonic, slow and full, Heasley's pieces are the light of live studio improvisations. Using electronic processing and the physics of sound, his current of sustained notes transforms into a confluence of layered tones. Cavernous reverberations set a soft glow to the waves of sound and the listener is lulled by the sonic scenery of this smooth ambient soundscape. In his homage to the horn, Heasley, an artist in pure sound, attempts to realize that twilight colour between the purple and the grey, all from the full course of a deep breath.